58 Burdekin sugarcane growers managing 8206ha adjusted their nutrient management in 2017-2018 through the Queensland Government’s Burdekin nitrogen project. 111 sugarcane farmers in the Burdekin and Wet Tropics regions managing 27,854ha applied 643t less fertiliser nitrogen in 2017-2018 through the Reef Trust Reverse Tender projects. 44 graziers improved land management practices on 788,770ha up to June 2018 through the Reef Trust’s Project Pioneer. 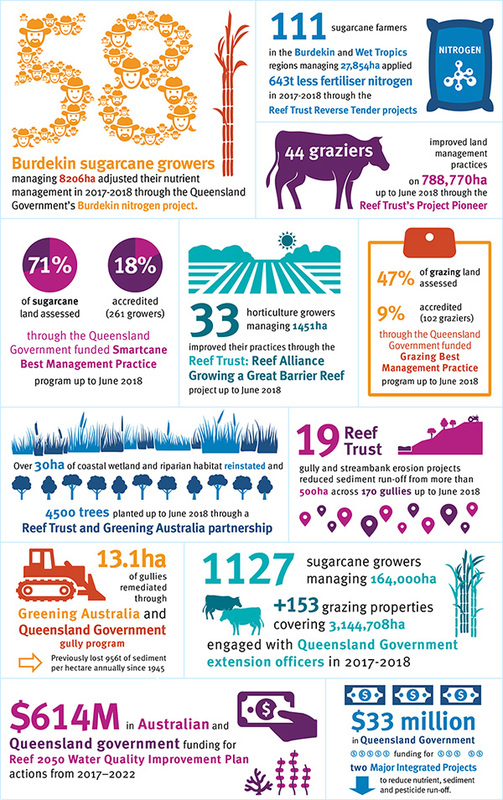 71% of sugarcane land assessed and 18% accredited (261 growers) through the Queensland Government funded Smartcane Best Management Practice program up to June 2018. 33 horticulture growers managing 1451ha improved their practices through the Reef Trust: Reef Alliance Growing a Great Barrier Reef project up to June 2018. 47% of grazing land assessed and 9% accredited (102 graziers) through the Queensland Government funded Grazing Best Management Practice program up to June 2018. Over 30ha of coastal wetland and riparian habitat reinstated and 4500 trees planted up to June 2018 through a Reef Trust and Greening Australia partnership. 19 Reef Trust gully and streambank erosion projects reduced sediment run-off from more than 500ha across 170 gullies up to June 2018. 13.1ha of gullies remediated through Greening Australia and Queensland Government gully program: previously lost 956t of sediment per hectare annually since 1945. 1127 sugarcane growers managing 164,000ha + 153 grazing properties covering 3,144,708ha engaged with Queensland Government extension officers in 2017-2018. $614M in Australian and Queensland government funding for Reef 2050 Water Quality Improvement Plan actions from 2017-2022. $33M in Queensland Government funding for two Major Integrated Projects to reduce nutrient, sediment and pesticide run-off. New projects, increased funding, innovative approaches and a focus on resilience and restoration are providing hope for the future of the Great Barrier Reef. Both governments are also committed to addressing global climate change and reducing greenhouse gas emissions. In response to recent coral bleaching events and the fundamentally changed character of the Reef, the governments recognised the need to accelerate priority actions to improve Reef health. The updated Reef 2050 Long-Term Sustainability Plan (Reef 2050 Plan) and new Reef 2050 Water Quality Improvement Plan (Reef 2050 WQIP) aim to protect the Reef’s values. This multi-pronged approach builds on the great work already underway with many landholders making long-term transformational changes that reduce pollution run-off into local waterways. They are also piloting innovative techniques that can deliver creative solutions. Working in partnership with landholders, natural resource managers, industry, Traditional Owners, researchers, communities, local governments and conservation groups will make a clear and tangible difference to Reef health.